Like other living tissue, your teeth can feel. Dentin, the layer below the enamel, houses fluid-filled conduits that transmit temperature or pressure sensations to a nerve network within the tooth’s inner pulp. It’s so effective that incoming sensations must be buffered — “toned down”— to avoid a painful overload of the nerves. The enamel above the gum line and a bone-like substance called cementum below help do this. Unfortunately, if teeth lose this protection they can become hypersensitive. This can cause a flash of sharp pain while eating or drinking something cold or hot or just biting down. There are a number of causes for tooth sensitivity, any of which can influence how we treat it. 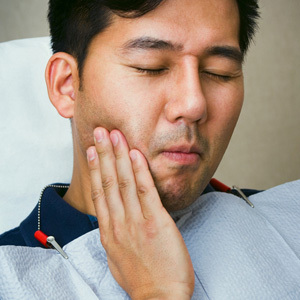 While you’ll need a dental exam to know for sure, your hypersensitivity will more than likely stem from one of these 3 problems. Periodontal (gum) disease. This is an infection caused by bacterial plaque, a thin film of bacteria and food particles that accumulates on the teeth due to poor oral hygiene. The inflamed gum tissues weaken and detach from the teeth, causing them to shrink back or recede. This leaves the cementum unprotected, which easily erodes and exposes the dentin to acid and bacteria — and hypersensitivity. Clinically removing the plaque helps the affected gums heal. In extreme cases, the gums may need surgical grafting to regenerate. Overaggressive brushing. While a lack of oral hygiene can contribute to gum recession, ironically too much hygiene — brushing too hard for too long — can damage your gums and cause them to recede. Brushing really doesn’t require a lot of elbow grease — a gentle scrubbing motion over all tooth surfaces is sufficient to remove plaque. Fine-tuning your brushing will help your gums to recover and heal. Mouth acid. Although quite strong, enamel has one formidable enemy: acid, which can erode enamel and expose the dentin. Over-indulgence in acidic foods and beverages can make your mouth more acidic; more likely, though, bacterial plaque will again be the culprit, because bacteria excrete an acidic waste product. You can reduce mouth acid with daily brushing and flossing and consuming less acidic foods and beverages. If you’re experiencing any kind of tooth pain, see us for an examination. We’ll determine the cause and initiate the appropriate treatment to regain your oral health.